I’ve seen the statistic time and time again. During World War I and World War II our nation was able to produce a staggering amount of food in backyards. 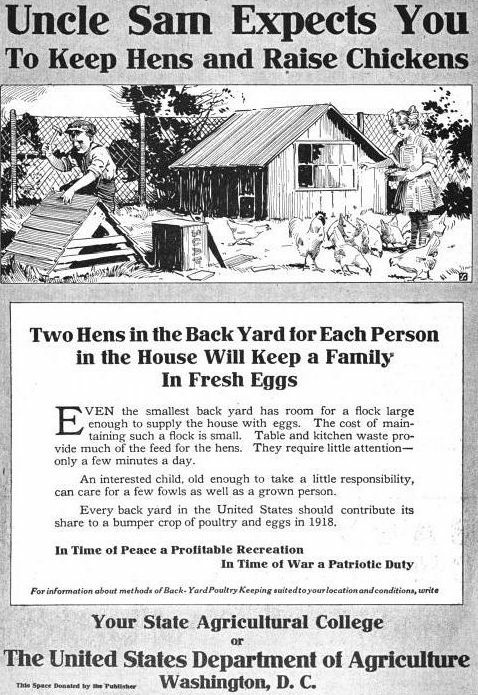 During World War II we were able to produce 40% of our food in backyard Victory Gardens (and backyard Victory Flocks). That’s impressive to say the least. It really wasn’t that long ago that this occurred. But when the war ended it became the era of convenience food. Food that wasn’t really food, but just a shell of what food used to be. Gone are the days when people knew how to break down a chicken carcass, let alone know how to slaughter one. Everything now is boneless and skinless. It’s no wonder kids today don’t realize that chickens actually have bones. Urban farming has seen a resurgence with the economic slump. Our food system is laying next to our economy in the toilet. Gone are the days of the Victory Garden, but it appears that they may be coming back. Our food system has become so adulterated with chemicals, food borne disease and GMOs that it’s no wonder people are becoming increasingly wary of it. Our arable land is becoming increasingly polluted and scarce. I’m meeting more and more people, almost every day, that want to know more about growing their own food and raising their own livestock. Every single one of them wants to do it because they want to save money and they want to eat healthier food. They want to take control of their own personal food system and be able to depend on it if they need to. But there are naysayers that say this is just a fad. We’re not serious and we won’t stick with it for very long. It’s too much hard work and not sustainable. They say that when we get tired of it we’ll just go back to the industrial food system because it’s easier and cheaper. I can’t argue with easier, but I sure can argue cheaper. Last year we spent $655 on seeds, plants, trees, irrigation supplies, and amendments. That $655 turned into 1,232lbs of food. Even at just $0.71/lb (the average price for conventional produce) I still saved nearly $220. Of course that savings increases substantially when you compare it to organic, local food. With inflation this savings may become more and more. So is this a fad? Maybe for some it is, but for many of us it is a lifetime commitment. We have educated ourselves about where our food comes from and once you know enough to be disgusted enough to grow/raise your own the more likely you will be to stick with it. If it was exceedingly difficult people wouldn’t take it on in the first place. It’s also important to note that urban farming isn’t anything new to the United States, let along new since WWII. It’s just recently with the focus on food deserts, food security, and policy have brought urban agriculture to the forefront. Now that it’s making headlines people all of a sudden are thinking that it’s this new hobby people are taking on. My grandfather kept his Victory Garden until he died. He taught me how to grow food and how to appreciated homegrown food. My mom grew food. Once I moved into my first house after college (I lived in apartments up until then) I started growing food as well. I’ve had a love for producing my own food almost my entire life. Every Spring I get this overwhelming desire to plant seeds. For me this is not a fad. I have friends that have urban farms because it’s something their family has always done, including raising livestock. For them it’s not a fad. We talk to people that remember growing up visiting their grandparent’s or other relatives’ farm and they want their children to appreciate food like they do. For them, this is not a fad. Eventually the media coverage will die down and people will just continue on urban farming like we have been. We’re building a new way of life. Growing up my family always had a large garden and bees. Now that I finally have a home of my own, I have a garden 🙂 I am hoping over the next 2 years to add bees and chickens! I agree, for some this is just a trendy thing to do, and for them, ultimately convenience will win out over hard work. My own grandparents maintained their own gardens throughout world war II, to supplement rationed foods. They gardened their entire lives, taught their children to garden, and so it was passed on. I’ve always gardened, and always will, so long as I am able. I would rather be able to savor food with flavor, than eat for convenience. More than that, I simply enjoy growing my own! Perhaps for some, urban gardening is a fad – something to do while money is tight that happens to be trendy right now. Not all of those people will have the patience or knowledge to be successful at it and we all know that if you feel like you’re failing at something it’s not long before most will give up. Nicole, you bring up a good point. I always tell people when they ask for gardening advice that they should expect to fail miserably the first year and a little less miserably each following year. We’re constantly learning and nature isn’t always cooperative, so be patient and learn to be resilient. Well, I’m new to urban gardening, but I plan to make it a part of the rest of my life! I’ve fallen in love with producing my own food and knowing where things come from and most importantly, knowing what’s NOT a part of my food. I started my move away from factory farmed meats due mainly to my concern for inhumane treatment of the animals that we use for food. In the process, I learned more and more about the dangers of the meat and even the produce that is the result of modern agribusiness. As a result, I am now one of those people who knows too much and is too disgusted by the commercially produced foods to ever go back! Well, we are totally hooked on raising grub here at Motherclucking Manor. I do not see this being a mere fad or trend for the folks who really fall hook line and sinker for their chickens and taters. This lifestyle? It’s not for everyone, that’s for sure. The transition into it takes a lot of hard work, time, and dedication. For a lot of people, it’s literally a 180 degree life change. A fad? There is no such thing as a pop-up instant urban farm. Anyone that thinks they can just drop some big bucks and make it happen overnight is fooling themselves. Those are the folks for which it’s a fad. It’s taken me 4 years to get to the point I am now. And I wouldn’t go back for any reason. I can’t imagine life without my goats or other critters. They have enriched my life in unfathomable ways. Each year, as I learn what works for my micro-climate and soil conditions, the amount of food I can produce grows exponentially. So does the amount of money I save. I’m eating healthier, getting exercise, and meeting some amazingly wonderful people who are also practicing urban farming. The benefits are mental, physical, and emotional. Unfortunately, just like any other issue in life, there will be a few very vocal people who shout out loudly against it and try to convince the world they are right. There will be a few who rise up to defend the practice, whatever it may be. But in reality, just like most politic and religion (those taboo table topics), 90% of the population doesn’t give a damn about the issue. If they did, we’d see a higher percentage of folks active in the debate and making that oh so inconvenient trip to the ballot box. Eventually, the nay-sayers will realize we’re here to stay and move on to some other urgent life and death matter. I wonder what they’ll be attacking next? The media has made this urban farming movement into a fad, however, I believe for 90% of the people that actually take the time to go out into the yard or onto their patio and start growing things, that they will continue to do so for some time. The latest stage of my journey started 6 years ago, with the addition of chickens 3 years ago. The ability to work on my little homestead is what keeps me sane after a 45+ hour work week. I can only hope what I do can instill a little bit of the bug to grow things in my kids. I know now that my parents did the same for me when I was a kid, in this very same urban backyard.